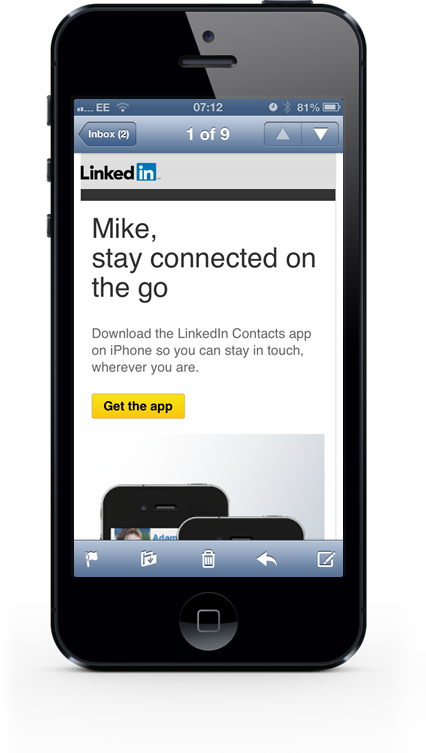 Note: Since writing this article LinkedIn have made the Contact app available in the UK. This morning I received an email from LinkedIn suggesting there was a smarter way for me to stay in touch with my contacts by using the new LinkedIn Contacts, a yet to be seen as useful services which turns LinkedIn into your address book by allowing you to important all your contacts from Gmail and Yahoo. Always ready to try a new service, I imported all my contacts and immediately received an email from LinkedIn with another suggestion; this time to use their LinkedIn contacts App. As I already have the LinkedIn app and CardMunch (by LinkedIn), and was now well on my way to get fully immersed in the whole LinkedIn spirit, I thought ‘why not’ and clicked to download. To my surprise one of the largest databases in the world, which houses the most complete information on almost every business professional in the world failed to know that I was living in the UK and not the US and therefore not eligible to download the new LinkedIn app. This is not a blog post about me being bitter about not being able to download LinkedIn’s latest app, but about the usage of big data. LinkedIn knows where I work, where I live, my age and phone number. They can socially profile me and link this to their data. Yet they still send me an email that resulted in a broken promise. Does your organisation use data effectively? Do you have a segmentation strategy? Are you sending your customers irrelevant offers for products that are of no interest to them (at least LinkedIn got my interest right!)? Or worst of all…Are you breaking promises with your customers? Data can be immensely powerful but also very dangerous. Too little segmentation and the irrelevance of the message loses clients and your communication becomes ‘spammy’. Too much segmentation and you risk missing out on an audience that might also be interested in your product. As much as we may want to create a one-on-one dialogue with our customers, in most cases it is simply not scalable. With the amount of data that most organisations have available to them, it can be extremely difficult to decide how to segment effectively. Jordan Elkind, in his blog post The Segmentation Conundrum, gives us a very simple but helpful rule of thumb: R.E.A.L. Relevant. Is the segmentation relevant to your customers and your products? Efficient. Are your segments broad enough to capture the maximum amount of customers, whilst still playing on specific customer behaviour or preferences? Actionable. Can you act on the level of segmentation you want to achieve? Lasting. Will your segmentation remain relatively stable over time? One-off’s and short term segmentation can become irrelevant very quickly. I honestly don’t think LinkedIn had much of a strategy in this case, but maybe for them it was simply more efficient to ‘send to all’ and risk a few disgruntled blog posts! It is not often that I am genuinely impressed with an ecommerce website and the online purchase experience. Most of the time you are left thinking “wouldn’t it be great if the site had this…” or “why haven’t they made that easier…“. However, this week I was left impressed (see first point below). It made me reflect on my best ecommerce experiences and the features and functionalities that made it so great. Below I have started a list of examples of buying experiences, functionality, UX and look and feel. Feel free to ping me other examples and I will add them to the list. Most of the mainstream wine sites look and feel dated and have terrible UX. Not Naked Wines. Apart from a simple, easy on the eye look and feel, it is the user-journey that impressed me. 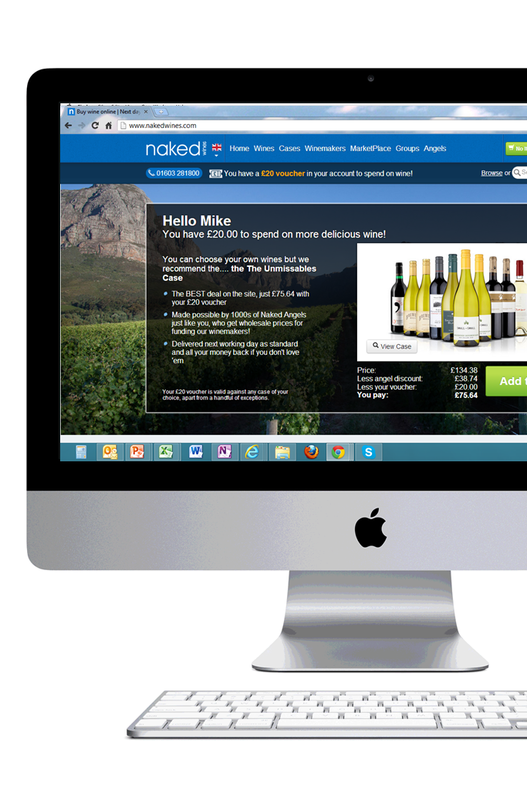 Rather than presenting you with the traditional ecom site layout, Naked Wines chooses to break the usability rules and ask you some questions first. The fact is the questions immediately and effectively transmit their ethos and concept. After completing the questionnaire, assuming you have answered them ‘correctly’, they present you with a gift for being an ‘Angel’ – a £82 discount on a pre-prepared selection of wines. I was sold hook, line and sinker. After completing the seamless checkout process, I was surprised to find my account with a £20 credit, which they offered as a gift for placing my first order. Second order pretty much guaranteed. Nice touch! I have a pet hate: buying groceries online. I can never remember what I want, the brands that I prefer and invariably forget the most important items. Not any more. Tesco’s integration of their Clubcard in the online shopping experience means I can now see what I have previously bought in-store from my Clubcard history. Such an obvious feature but missing for a long time. I also think their ‘multi-search’ functionality is brilliant. 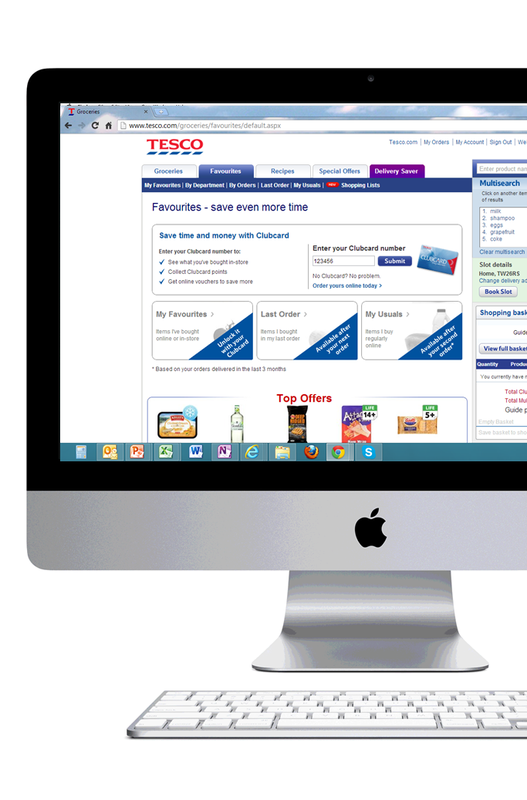 Easy to use, it allows you to search for your entire shopping list in one go. This was a close run between Made.com and Fab.com, and I suppose it is down to taste. 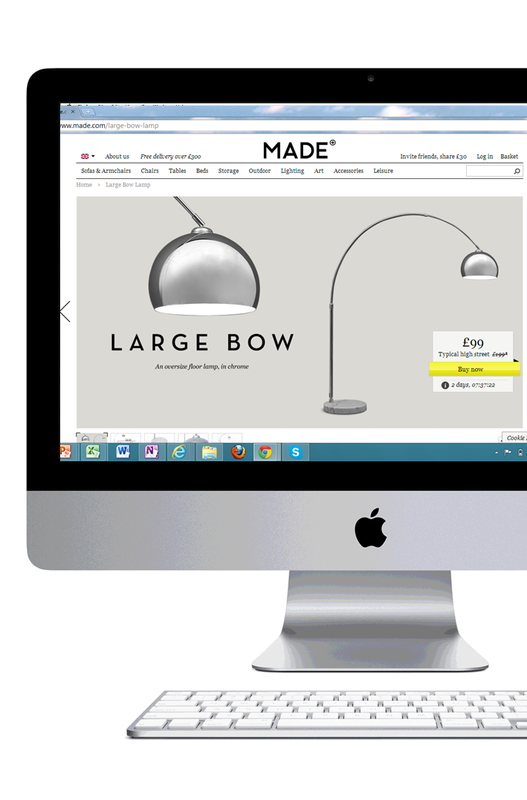 I like Made.com because I favour the clean design. It really is (apart from apple.com)one of the few ecommerce sites which is not cluttered with products and promotions. Each individual product takes centre stage, with impressive photography. There is plenty of content to allow you to make an informed choice, but somehow it is still totally minimalist. Really like the functionality that allows visitors to ask questions about a product and the staff recommendations. I don’t buy there often, but it is a great experience. The app is easy to use. 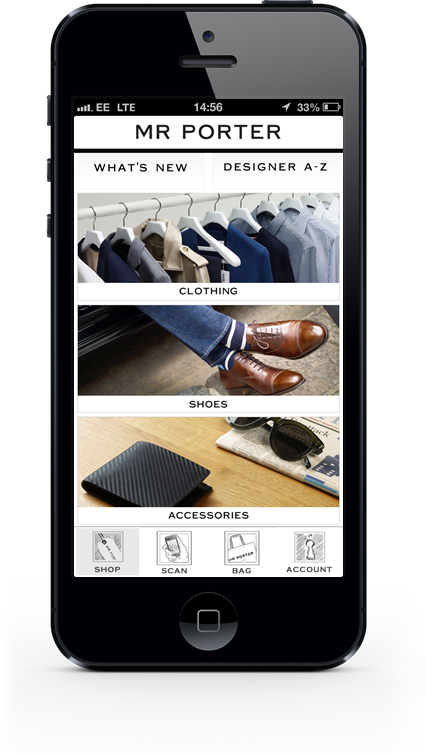 The home screen is intuitive and offers a minimal choice of options, however, you are only ever one click away from your product list page, which has the most comprehensive filters you will ever find on a fashion app. Plenty of product images and Editor notes for almost every item make it the best shopping app experience for me. Although you can’t buy directly on Google Shopper, I wanted to include it as it has saved me a fortune over the last few months. Before I buy anything, especially at airports where you are confronted with very enticing discounts (mainly on products you don’t need!) I quickly go on Google Shopper to compare prices. 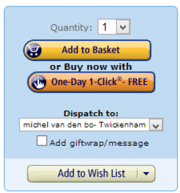 Within seconds you can see whether you are getting a good deal, or whether you can get it cheaper elsewhere. The great thing about this app is that it not only compares prices from online shops and the likes of eBay, but it also compares the prices from high street shops in your local area. 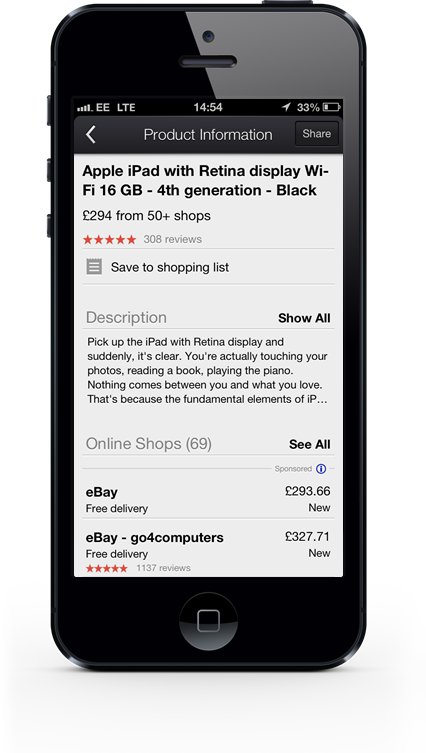 It also allows you to save your searched item to a ‘shopping list’ meaning that you can refer back to see which impulse buy you managed to avoid….Great money saver! I hope you like the list and, as mentioned above, if you want to share your favourite ecommerce site or feature(s), use the comment box below and I will add them to the list.